Rafael Irizarry recently proposed that the standard 50 min seminar be reduced to 25 min, with the extra time devoted to discussion. I commented there but should have just written at greater length here. I’ll do so now. The overriding characteristic of a bad seminar is a lack of empathy for the audience. Skipping the motivation and jumping into a pile of theory. Covering way too much material too quickly. Talking about something that is boring and/or trivial. Mucking about in details, particularly regarding simulations results. Going over time, even by a minute. Self-censorship is important. If you don’t have something new and interesting to say, talk about something old and interesting or don’t talk. Rafael Irizarry wrote about how meetings at work get in the way of actual work. I agree with his central point, that it can take some time to get back working on a project (whether data analysis, programming, or writing), and so blocks of less than a couple of hours can be inefficient. Meetings that break up a work day can really erode one’s productivity: academics often spend too much time meeting and not enough actually working, and three hour-long meetings spaced evenly throughout the day can mean that you don’t get anything real done in the other five hours. My R package, R/qtl, contains about 33k lines of R code (and 21k lines of C code). Some of it is quite good; some of it is terrible. Here’s another example of the terrible. I’ve long needed to revise the function scantwo, for performing a two-dimensional genome scan for pairs of loci. I was looking at the function today, and was aghast to find that it’s 1354 lines long. That’s 4% of the R code in the package! And the R code is just moving data and results around; the actual calculations are in C (in a series of files that comprise 4725 lines — 20% of the C code in the package). Barry Rowlingson gave an interesting talk at UseR 2011, “Why R-help must die!” He suggested the Q-and-A type sites Stack Overflow (on programming) and Cross Validated (on statistics), both part of Stack Exchange. An interesting feature of these sites is that, in addition to voting up and down on the questions and answers, one accrues reputation points. I’ve found this to be surprisingly addictive, and perhaps that’s the goal. Consider the O’Reilly book Gamification by design. I agree with Barry that these sites are an excellent replacement for R-help, which I stopped paying attention to years ago. The format is easier to read, math and code can be nicely formatted, the questions are tagged, search is easier, and there should be less redundancy. But currently the R questions at StackOverflow are rather advanced, and so I’ve found the general statistics site, Cross Validated, a bit more fun (that is, I’m more able to answer the questions). 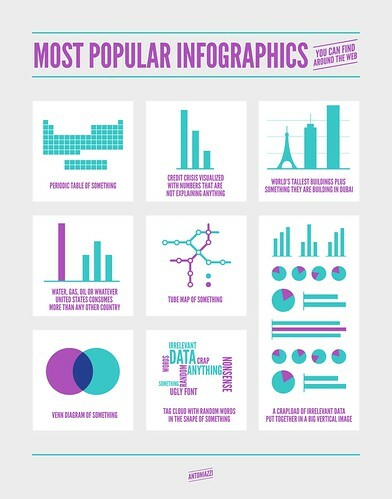 I saw this great infographic at Andrew Gelman’s blog. I’m inclined to buy an art print. Last week, I attended an excellent seminar by Chris Hittinger on the identification and evolution of lager yeast (see the paper), part of my favorite seminar series, on evolution. [Forgive me if this description is not fully accurate.] Ales are the original (proper, better tasting) type of beer; they’re brewed at a warmer temperature, with “top-fermenting” yeast (the yeast rises to the top or is suspended throughout the column). Lagers were developed in the 15th century in Bavaria and are brewed at a colder temperature, with “bottom-fermenting” yeast (the yeast settles to the bottom). Lagers spread world-wide in the 19th century, and now are the most popular fermented beverage (but that’s mostly swill). The yeast for brewing ales is Saccharomyces cerevisiae; it’s apparently long been known that lager yeast is a hybrid between the ale yeast and something else, but the origin of that something else has not been known. Previous efforts to identify it have not been successful. Chris and colleagues (the SSS Consortium) sought to expand the known yeast species by gathering new strains in the wild on five continents. As part of that effort, they identified a new species in Argentina, adapted to fermenting in cold temperatures, that turned out to be the missing part of the hybrid that formed lager yeast. They believe that the yeast was brought from South America to Bavaria sometime after the 15th century (when lagers were first developed) but before the 19th century (when they became widespread). Who would have thought you’d have to go to Argentina to figure this out? Chris mentioned that he prefers lager, while his former postdoc advisor, Mark Johnston, prefers ales, and that they’ve had more debate on that point than on the science. I agree with Mark.